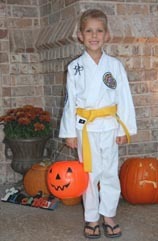 Here's Jacob on his way to do one of his favorite Halloween things ~ Trick or Treat! With that bright smile, he probably charms a lot of people into giving him an extra treat or two! His Grandpa and Grandma Bushaw are members of Cedar Rapids Corvette Club in the West Region. Look at Marlo relaxing before heading out for her annual Trick or Treat jaunt! Wow ~ check out those sunglasses! Her Grandpa and Grandma Bushaw are members of Cedar Rapids Corvette Club in the West Region. 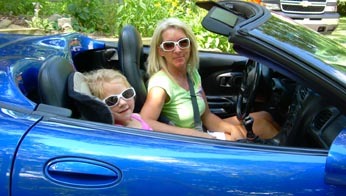 Look at Peyton getting ready to cruise in her grandma's 2002 Electron Blue Metallic convertible! Wow ~ they even have matching sunglasses! Her Grandma DeNike is a member of Capital City Corvette Club in the Michigan Region. 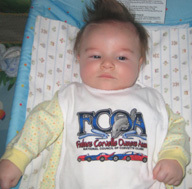 Check out 3-month old Jaiden sporting his new FCOA bib! His Grandma and Grandpa Larsen are members of Sunburst Corvette Club in the Midwest Region. They use their 1992 Brilliant Red coupe in shows, autocrosses and drag racing. Jaiden's dad is a Petty Officer 2nd Class on the USS Eisenhower. Look at Cassidy in her brand new FCOA T-shirt! She'll be smiling even more when Grandpa & Grandma Carnell take her for a ride in one of their Vettes. Hmmm, which one will she pick? The '76 or 2002???? Cassidy's grandparents are Members-at-Large in the Florida Region. 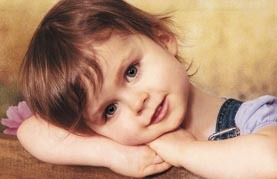 Marissa (FCOA #3028) & Braden (FCOA #3029) want you to meet their baby sister Celina! In July 2008 when she was 8 months old, she came with them to watch Nana & Papa autocross their '95 Vette! Nana Gillespie & Papa Kesselring are members of Windy City Corvettes in the Midwest Region; they also have a 2004 convertible. 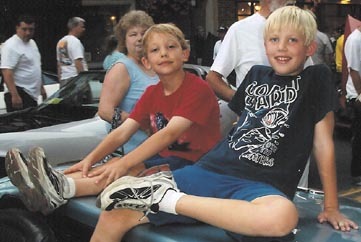 Here are 6-year old Max & 9-year old Jack relaxing on Grandpa and Grammy Paul's '63 Silver Blue roadster. They are in downtown Carlisle PA at the end of the Corvette parade that is part of Corvettes at Carlisle each year. Their grandparents are members of Cumberland Valley Corvette Club in the East Region. 4-month old Aidan's shirt says "My Pops says he'll buy my first Corvette" ~ no wonder he looks so happy! When he gets a little older, he'll have his eye on Grandpa Good's 2002 Vette. 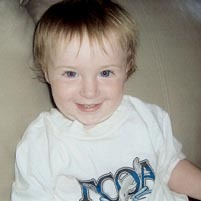 His grandparents are members of Lancaster County Corvette Club in the East Region. 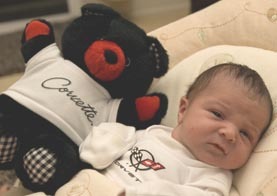 Check out 1-month old Maribel and her teddy all decked out in their first Corvette outfits! 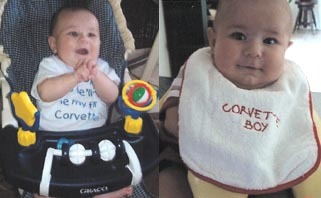 Grandpa and Grandma Schiller say they are "getting her started with Corvettes right away!" 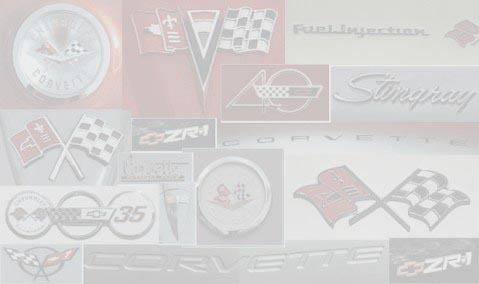 They are members of Antelope Valley Corvette Club in the West Coast Region. Looks like 6-year old Tommy and his grandpa are enjoying their Vettes on a sunny summer afternoon. His Grandpa and Grandma Smoluch are members of Suburban Corvette Club of Minnesota in the Midwest Region. 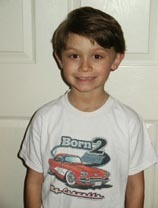 Tommy really likes to ride in both of his grandpa's Corvettes, a 1998 red convertible and a yellow 2005 coupe. 13-year old Brandon is pictured here with his younger brother Noah who is FCOA 4000. He enjoys working on cars with his dad especially tuning and modifying them. Brandon has won first place 3 times in the Kids at Carlisle model car contest ~ you can see the workmanship of some of his models in this picture. His parents, Michael and Tracy, are members of Cumberland Valley Corvette Club in the East Region. As a gift for Mackenzie's 3rd birthday, Aunt Kristy gave her a FCOA membership! 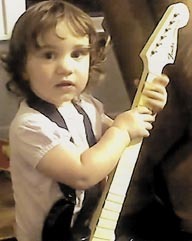 One of this budding musician's favorite things to do is playing the drums and guitar with her daddy. her Aunt Kristy is the proud owner of a '98 roadster and a member of Tulsa Vette Set in the Southwest Region. Here's a picture of 2-year old Evan in his grandparent's 1962 Vette ~ they can't get him to sit still so the picture's a little blurry. His Grandpa and Grandma Schmitz are members of the Free State Corvette Club in the East Region. They have owned the '62 since 1964 and have kept it in its original condition (even the spare tire!). Evan's mom sat in a car seat between her parents for several road trips in the mid 60s! Check out the picture of the '62 pulling a log splitter. Jake looks pretty relaxed in this picture that was taken when he was only 8 days old! His dad is making sure that Jake starts enjoying Corvettes at an early age ~ he says that this 2008 Z06 will probably be Jake's in about 18 years. Jake's dad, Mike, is a member of Suburban Corvette Club of Minnesota in the Midwest Region. Here's 2-month old Olivia trying to catch a nap in the C6-R. Soon she will be riding in the passenger seat with her big brother Justin (FCOA #3058) driving! Grandpa Alexander is making sure that she starts enjoying Corvettes at an early age. 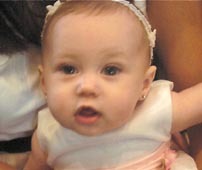 Her grandparents are members of Tiretown Corvette Club in the East Ohio Region. 2-year old Gracie loves sitting in the driver's seat of her parents' race-ready '66 and "driving" while making "vroom, vroom noises. Her mom Tiffany is a member of Lafayette Corvette Club in the Indiana Region.